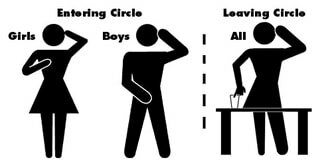 In order to enter or leave circle you must do it correctly, these are the correct signs used. Now we can't tell you all the games we play at circle - that would spoil the surprise. There is an epic tome written by a previous Social Sec (Peter Hurrel 06/07) but that is strictly for the eyes of the Social Sec. Nevertheless to get you started, here are a few simple games that often crop up. The number between 20 and 22 is sacred and must never be uttered in UWMXDHC situations. The fine is always a pint. The game is a classic: where you may say one, two or three consecutive numbers to pass the game foward, back or skipping a person respectively. "One - Fat - Frog - Jumped - Into - The - Pond - SPLASH!"